If I were to translate the name in Portuguese to English, it would sound so ridiculous, that you would probably laugh and laugh for days. It is basically a mixture of parsley, cilantro and green onion. I use it in a lot of my Portuguese recipes, and it really does help bring out the flavor. The best part is that it is frozen, so I can pinch off little bits at a time, and add to my food. It's just another way to make meal prepping quicker and easier. 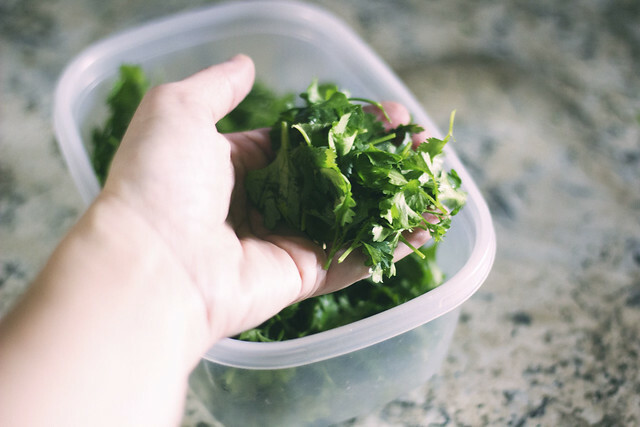 Start by washing the parsley, cilantro and green onion, being careful to remove any wilted leaves. Spread them out over some paper towels to dry completely. When dry, rough chop the green onions, removing the roots which you can place in a small glass container with a little bit of water, to regrow. I've been doing this for years and only really need to buy green onions once in a while. Mix all three in a freezer safe tupperware container, and place in the freezer. It keeps for up to one month. For cooking, I usually just add enough to my taste, depending on what I'm making. What a great idea! I never heard of freezing herbs like this, it would be so handy!